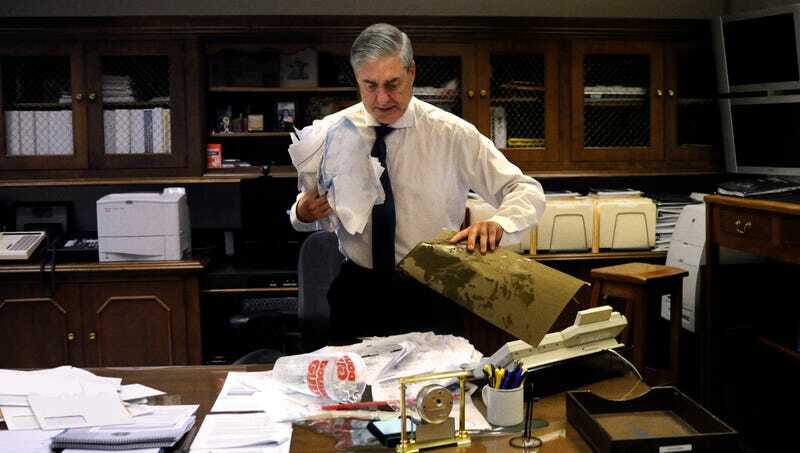 WASHINGTON—Suffering yet another unexpected setback during his ongoing investigation into foreign collusion with the Trump campaign, Special Counsel Robert Mueller scrambled Friday to contain the damage to his documents after spilling an entire Grape Crush Big Gulp all over his Russia evidence. “No, no, no! No! Aw, jeez, this is really bad,” said the panicked FBI investigator, frantically scooping handfuls of partially melted purple ice off of a painstakingly transcribed and annotated Michael Flynn interview back into its original 32-ounce plastic cup with his hands and attempting to blot it dry with an extra copy of the evidence inventory from his raid on Michael Cohen’s office. “Everyone’s going to be so mad at me for having my soda next to so much important stuff. Maybe if I spread it all out and let it dry, no one will notice? Dang it. I can’t believe I did this twice in one week.” At press time, Mueller was attempting to wring the purple moisture from Maria Butina’s signed confidential disclosure statement and wondering if 7-Eleven would give him a new soda for free if he explained what happened.